The AXP, formerly called the Intern Development Program (IDP), provides a framework to guide you through earning and recording your professional experience. The program covers everything from site design to project management and prepares you to practice architecture independently. 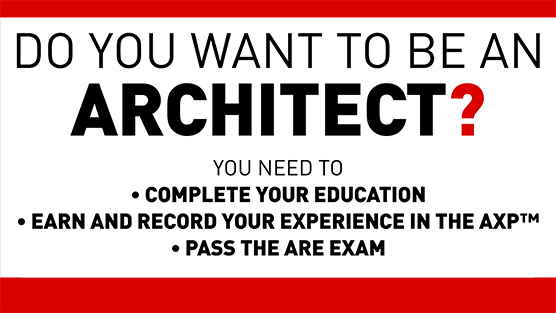 The Architectural Experience Program (AXP) is an essential step in the path to becoming an architect. Through the AXP, you will learn about the daily realities of architectural practice, acquire comprehensive experience in basic practice areas, explore specialized areas of practice, develop professional judgment, and refine your career goals. The AXP is developed and administered by the National Council of Architectural Registration Boards (NCARB). In most jurisdictions, completion of the AXP is a requirement for initial registration (licensure). The AXP identifies the tasks that are essential for competent practice. The program is structured to prepare you to practice architecture independently upon initial registration. Assistant Professor Adjunct Michael Samuelian will be giving a presentation covering everything you need to know about the Architectural Experience Program (AXP®) including upcoming changes to the Architectural Registration Exam (ARE) such as: how to begin your NCARB record, new structure to the AXP®, new rules for reporting your experience for the AXP®, changes to the structure of upcoming ARE 5.0, and transition from IDP to AXP®. Informal lunch will be provided. This event will take place in rm 312F and is open to students, faculty and staff of The Cooper Union.